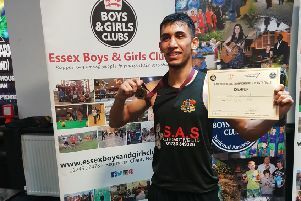 Chatteris boxer Jordan Gill says the level of recognition he has received after winning his first title has been “overwhelming”. 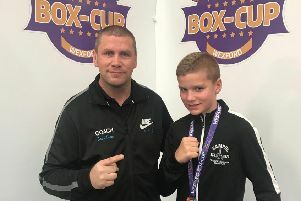 The Fenland fighter was the special guest at a celebration event held at Chatteris Town FC’s West Street ground on Saturday in honour of winning the Commonwealth featherweight championship. Players and supporters alike had the opportunity to meet and take photographs with Gill and his new belt while the fighter watched on as the Lilies ran out 4-1 winners over neighbours March Town Reserves. “I can’t thank everyone enough. It’s been quite surreal,” Gill said. “I’ve had so much support and a lot of people have come out and said ‘well done’, so it’s quite overwhelming. “For me to be able to bring this belt back to Chatteris is a big deal for me. The weekend event was the first hometown recognition function Gill has attended since the fight, and he’s sure to be in line for more special occasions after defeating Ryan Doyle to win the crown. “The local councils might have messaged me, they might have not. I’ve had that many messages it’s hard to get through them all,” added Gill. “The fight was a good fight. He was a tough guy. He took some good shots and came back with his own. I think, in the end, what separated us was the level of skill.